1. 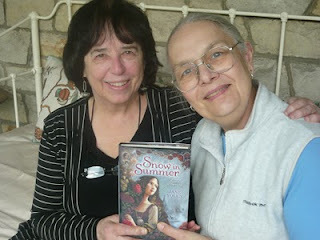 Debby, how did you meet Jane Yolen? I first met Jane Yolen in person in London in 1989, at the 14th World Fantasy Convention. I had recently read her short story anthology, aptly named Tales of Wonder, and having been bowled over by the experience, was agog to meet the tale-spinner herself. I begged my friend and writing mentor Katherine Kurtz to introduce us, and she very kindly obliged. Ironically, Jane and I might easily have crossed paths much sooner and much closer to home. Our geographical nexus was the ancient Scottish burrough of St. Andrews, home of golf and birthplace of Scotland’s oldest university. I had come to St. Andrews as a student in 1981, had brazenly entrapped an unsuspecting Scottish lad into marriage, and had remained on location to complete what eventually became my first published novel, The Burning Stone. Jane, meanwhile, was making semi-regular academic pilgrimages to St. Andrews in the company of her husband David, a professor in Computer Sciences, who was doing joint research with Scottish colleagues at the University. Whatever you choose to call it - coincidence, providence, serendipity - with this common ground to build on, our friendship blossomed quickly. Twenty-two years down the line, hanging out with Jane is one of the great delights of my life. 2. How long have you worked together? Jane began working with my husband Bob long before she started working with me. Their joint publications include a handful of short stories and eight young adult novels - four Scottish historical novels and four fantasy novels based on Greek mythology. When they first began writing as a team, I intended to keep my distance and leave them to their own devices, but as time went on, I found myself getting drawn into the creative process from an editorial perspective. It began partly as a social obligation: when you put two or more writers together in a room, it’s only a matter of time before they end up talking shop. If Bob and Jane were grappling with a writing issue over dinner, my only choices were either to leave the room (which was rude) or get involved in the discussion. After a while, somewhat to my surprise, I discovered I seemed to have a flare for textual trouble-shooting. Not only that, but I enjoyed the role of text doctor. The book in question was Dragon’s Heart, the long-awaited fourth novel in Jane’s Pit-Dragon series. The manuscript was full of gripping moments. Even so, I had to concede that it had its rough spots. Swallowing my qualms, I packed up my sheaf of notes and trotted across the Lade Braes (a strip of parkland which bridges a rippling burn between my neighborhood and Jane’s lovely St. Andrews home, Wayside) and braced myself to deliver my diffident verdict. I need not have worried. Jane is nothing, if not the ultimate professional, when it comes to confronting her own work with an eye to perfection. For three and a half hours, we sat and discussed ways and means. At the end of our brain-storming session I went home floating on air. I’d actually been of editorial assistance to one of the best writers I’ve ever met. Since then, whenever Jane comes back to St. Andrews, she’s given me a manuscript to read. 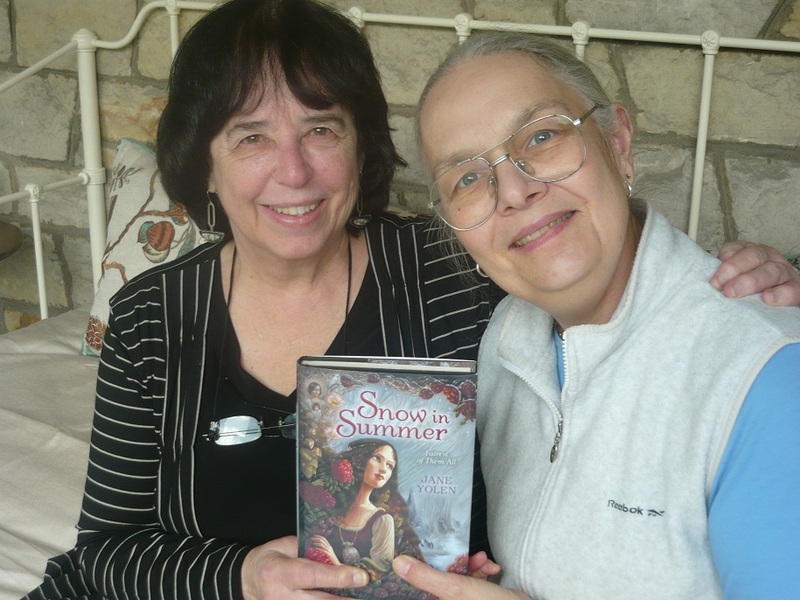 Two summers ago, it was the first draft of Snow in Summer, a striking re-telling of Snow White and the Seven Dwarves in an American setting. This past summer, it was a novel-length expansion of Jane’s acclaimed short story “The Thirteenth Fey”. Jane’s positive response to my editorial in-put has boosted my confidence as an editorial reader. I’m looking forward eagerly to my next opportunity. 3. How hard is it really to edit a writer like Jane Yolen [especially with her poetry]? Without necessarily intending to, I see I’ve partially addressed this question in my previous response. But I’ll be happy to elaborate. To begin with, my own talents, and consequently my critical instincts, are limited with reference to poetry. Although I’ve taught the craft of poetry to inexperienced creative writers, I don’t consider myself qualified to provide editorial recommendations to established poets like Jane - hence the fact that my editorial contributions to Jane’s work are limited to a consideration of her fiction. Leaving aside questions of genre, however, I can repeat without reservation that Jane is the epitome of the professional writer. Her one over-riding priority at all times is to produce a work that fully lives up to its potential. Her responses to editorial feedback are invariably measured and thoughtful. She never rejects a suggestion without consideration, and her decisions as a writer are invariably sound. What’s it like to edit a writer like Jane Yolen? Scary (from my own point of view), but ultimately encouraging and illuminating. Every time I read one of her manuscripts I improve as an editor. It really is a privilege and a joy. Thank you for visiting us, Debby. We'd love to see you here every month, so please join us as a regular guest! Debby does edit for other authors, so please visit her website for more information. Readers, if you have questions for Debby, please leave them in the comments. If you'd like to buy any of Jane Yolen's books, she suggests shopping online or in person at the bookshop of the Eric Carle Museum of Picture Book Art. I'm so honored to have you visiting, Debby. I'm at the Mountains & Plains Independent Booksellers Assn. Conference even Denver, even as I type this so will check in as I can. But readers, please do leave comments for Debby, and perhaps even Jane will drop by. I enjoyed meeting you Debby and loved the story of how you came to be working with Jane. What a wonderful "marriage" of talents. I do hope you will come back as a frequent guest. I'm glad I kept reading after the "over 300 books in various genres" and being bowled over by that! Loved learning more about your and your experience with Jane Yolen, Debby! I know you must be a well of great information and advice! Thanks for this, Dani. As I love working with Debby, I love sharing this space with her. She is a dream beta reader, and has helped me see ways to deepen and reshape my work. I can't recommend her high enough! Amazing story of how you got into editing, Debby! A bit of a jump into the deep end, but with a life-jacket (your friendship and Jane's willingness to accept critique) at the same time. I can imagine how hard it must have been to make the decision to take that sheaf of notes to Jane, rather than go the route of not potentially ruffling feathers and simply saying, "It was great!" This is an honor to have you on this blog. I've been hearing about Jane Yolen for many years. You both are impressive women! Great interview. It's really amazing how truly small this world actually is. Debby, Sorry my comment is late, I was away giving a workshop this weekend. I love Jane Yolen! Her "Owl Moon" was the perfect fantasy to read to my sons as they struggled with their father's suicide--it was so real it made us shiver with delight. What fun to have been taken into her inner circle of trusted voices, and in a way that resulted in such growth for you. I love stories where people have reached out in all the right directions and life provides just the right match. I'd love to add my voice to the others: please come again!